VIBE magazine teams with Hong Kong based B2 Music to launch a new "Best of Asian Hip Hop" series. The first of its kind, "Urban Asia Vol. 1" includes hits from top Chinese superstars Jackson Wang, Higher Brothers and Edison Chen, as well as bangers from India, Japan, Korea, Thailand and Mongolia. This series captures the new Urban Asia Movement at its best. New York, NY, May 09, 2018 --(PR.com)-- VIBE announces release of "Urban Asia Vol. 1," a compilation series of top Asian hip-hop and rap. VIBE, the global leader in hip-hop and R&B news, business and lifestyle announced today the launch of the first in a series of compilation albums featuring the hottest hip-hop and rap music from across Asia, in connection with VIBE’s Hong Kong-based partner, B2 Talent Asia. 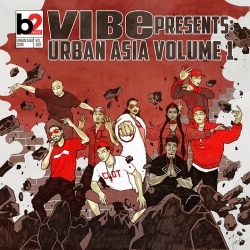 The compilation album, VIBE presents Urban Asia Vol. 1, is to be released worldwide on May 9th. VIBE presents Urban Asia Vol. 1 features many of the region’s leading music stars, including Higher Brothers from China, Thai hip-hop pioneers Thaitanium, Raja Kumari and Divine from India, as well as artists from Mongolia, Bangladesh, Korea and Japan. The 15-song project contains four exclusive tracks, including “Youth Anthem” featuring China’s Boss X and “Can’t Breathe” featuring K-Pop idol Jackson Wang from Got7. VIBE is part of the The Hollywood Reporter-Billboard Media Group. Billboard is the world’s largest voice in music, built on the most complete and well-respected database of charts across all music genres. The Billboard charts define success in music. From the iconic Billboard magazine to Billboard.com, the ultimate consumer facing destination for millions of passionate music fans, to the industry’s most elite conference series and influencer events including the Power 100 and Women in Music – the Billboard brand has unmatched authority among fans, artists and the industry alike. Billboard has a social media footprint of 16.4 million social followers across Facebook, Twitter, Instagram and Youtube, and creates more than 200M cross-platform video views per month. Billboard magazine has published major news-generating covers recently including Travis Scott, Zayne, Lorde, Marshmello, Demi Lovato, Cardi B, Selena Gomez, Emimem, DJ Khaled, Charlie Puth, and an open letter to Congress signed by 180+ of the music industry’s biggest stars and executives. In 2017, the Women in Music ceremony, which honored Selena Gomez as Woman of the Year, was live-streamed globally on Twitter. In 2016, the The Hollywood Reporter- Billboard Media Group acquired SpinMedia’s storied music assets SPIN, VIBE and Stereogum, establishing the world’s largest music brand by digital traffic, social reach and audience share. The combined entity of music and entertainment properties now reaches 47 million unique visitors, and one in every three millenials. B2 Holdings Ltd. is a Hong Kong-based talent management company, record label and entertainment advisory firm. B2 represents established and emerging Asian talent, as well as Western talent and music management companies seeking opportunities in the Asian market. Additionally, B2 Music, B2’s record label, focuses on presenting the best Asian music to an international audience. See www.b2talentasia.com. Urban Asia Vol. 1 include 15 of the best tracks coming from the Pan-Asian Hip Hop scene right now.